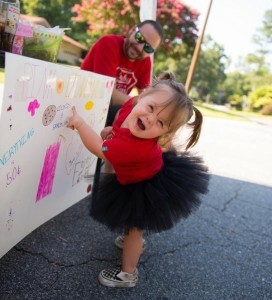 The 2016 walk season marks the third year of participation for Team Ruby in the Atlanta Buddy Walk®, hosted by the Down Syndrome Association of Atlanta. The team is named for Team Captain Nicole Eliason’s two-and-a-half year old daughter, Ruby, who is a lover of all things outdoors. Ruby especially enjoys playing with the soccer ball, dancing, music, and spending time with her two older siblings Eli (10) and Maddux (8). Team Ruby was formed the year after Ruby was born. 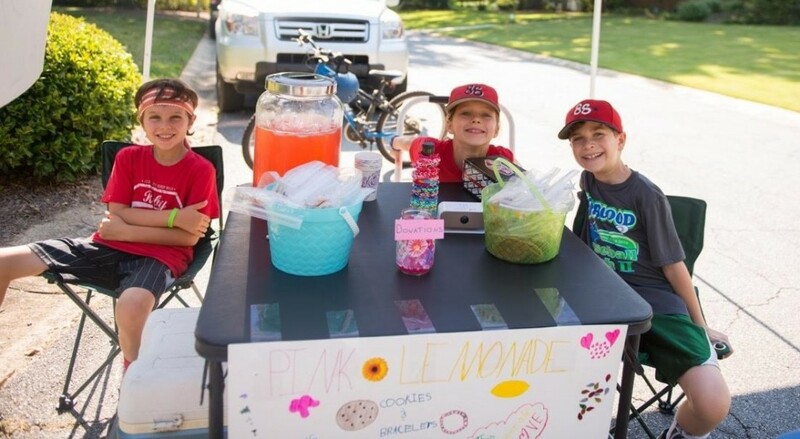 “The daughter of one of our close friends came up with the idea to do a lemonade stand. She and Ruby’s older siblings decided to turn it into a fundraiser for Team Ruby.” The kids held the fundraiser the very next day and raised $100 that first year. Fast forward to the summer of 2015, and the team decided to hold the fundraiser again. “In 2015, we promoted the lemonade stand a lot more on Facebook. It became more than just a neighborhood event. People drove from all over the city to come specifically to Team Ruby’s Lemonade Stand.” In addition to lemonade, the team also sold rainbow loom bracelets and cookies. Ruby also greeted customers, passing out hugs. In just one day, they raised $350! Not only that, they had a special matching donor, who added an additional $200 donation, bringing the grand total to $550! To stay up to date on Team Ruby, follow along with the updates on their Facebook page. 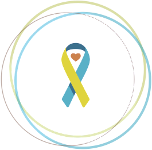 This post is a part of our ongoing Walk Team Spotlight blog series, which profiles Down syndrome walk teams sharing their unique backstories, as well as fundraising, recruitment and networking tips! Check back for future posts in this series coming soon. Submit your story ideas to: stories@ds-connex.org.